(CNN) – It's one version of the American dream: free McDonald's for life. For Mitt Romney's father, the dream was reality - the one-time Michigan governor was granted free meals at the fast food chair by its founder. Speaking at a fund-raising event in Chicago, the presumptive GOP nominee relayed a story about finding a special coupon in his dad's drawer. "I found a little paper card, a little pink card, and it said, 'This entitles George W. Romney to a lifetime of a hamburger, a shake and French fries at McDonald's.' It was signed by the hand of Ray Kroc. My dad had done a little training lesson or whatever for McDonald's when there was just a handful of restaurants and I saw this thing and was like, this is a gold mine, dad! What are you doing?" Romney said he laminated the card for his father, who he said went "almost every day" to McDonald's for either a hamburger or a fish sandwich. "He would present this little card and of course the person behind the counter would look and say, 'Well, what is that?' They'd never seen something like that, but he said it was never turned down. 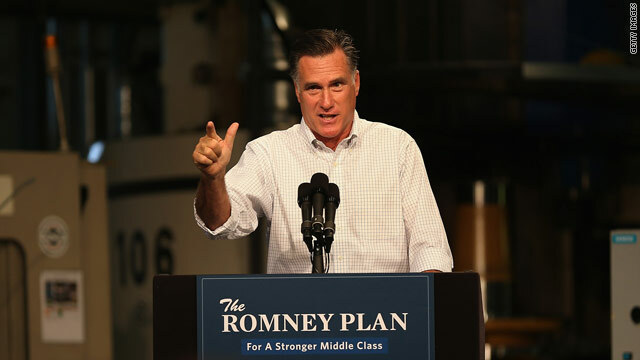 They always honored it," Romney said. George Romney, who ran for the GOP presidential nomination ahead of the 1968 election, served as governor of Michigan from 1963-1969. He was also the secretary of the Department of Housing and Urban Development under President Richard Nixon. Before you vote, think carefully about the possible consequences: 4 years of hearing this man's laugh. I ask you, is that something America should be subjected to? Don't expect the filthy rich to pay for food....or pay taxes. So, I'm working for 7$ an hour and this rich guy gets a (tax-free, no doubt) life-time benefit because he gave a couple of trainings? Will this happen with the entire country when this rich guy's son becomes president, we working for low wages and these people taking all they can from us? Good grief... way to connect with the 99%, Willard: tell them about every little privilege you've ever managed to get. "Daddy got for free what everybody else had to pay for" is especially effective - and making it something most everybody actually does pay for, so they can really relate to the story, is sheer genius. With good judgement and interpersonal skills like this, Mitt would make a spectacular president, no question.